Steaming out of St Petersburg in white vests, peasant dress and ushankas on head with ear-flaps akimbo, Otava Yo bring the abandoned traditions of Russian folksong bang up to date. The band offer a glimpse into old Russian village life, replete with romance, melancholy and merrymaking, a fierce sense of pride and a good dose of surreal humour. With the lyre-like gusil, global guitar, wailing bagpipes, expert fiddle-scraping, pumping bass and pounding drum, their songs of rural passions, heroic sailors, goats and pancakes are delivered with casual wit playful imagination. Much of Otava Yo’s repertoire is drawn from folk songs that were ‘lost’ during Soviet times, when a style of ‘fake’ folk music (usually involving balalaikas) became appropriated by the regime (Note: among the many instruments OY play, there’s not a single balalaika!). The band injects all that it does with a good dose of humour, which is particularly evident in its mockery of Russian stereotypes. Their songs, videos and live performances are imbued with energetic and unexpected wit. Otava Yo’s talent even earned them an award from Bratislava's Humor Academy! “Otava Yo is equal parts punk and Russian folk… they brought huge energy and serious fun to an outdoor WOMEX stage.” - NPR Radio. Otava Yo have performed at major European folk festivals and as far afield as Mexico and India; it only seems natural for them to charm British audiences next. Surreal, humorous and danceable – if you liked Gogol Bordello, you’ll like this! Otava Yo at The Apex on Sunday 6 March start at 7.30pm. 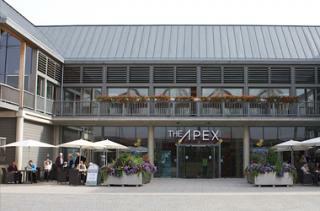 Tickets are £12.50, with £5 tickets for under 25s, ring the box office on 01284 758000 or see the website - www.theapex.co.uk for details.